Quince are a new treat that we have recently discovered and next year we are going to plant a quince tree in our garden. Place the sugar, water, vanilla seeds and cinnamon in a medium sauce pan. Bring the liquid to a gentle boil, stirring to mix. Peel the quinces and cut in medium thick slices. 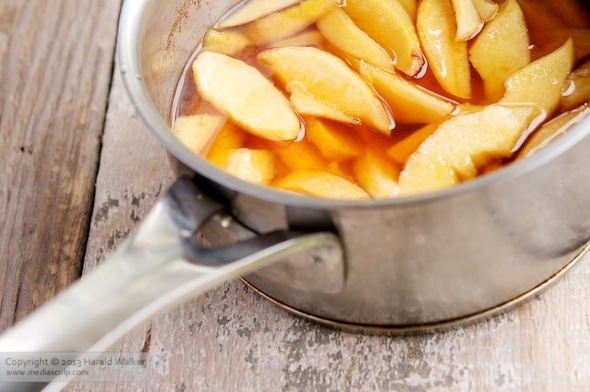 Place the quince pieces in the syrup mixture and poach on a medium simmer until soft. When the quince has become soft, remove from the sauce pan with a slotted spoon and place in a bowl. Cook the poaching liquid until it is reduce to about 1/3 cup and is very thick. Remove from the heat. Preheat the oven to 425 F or whatever the instructions say on the package of puff pastry. Spray the tart form with cooking oil. Thaw 4 slices of puff pastry or enough to cover the tart form. Lightly flour your work surface, lay the puff pastry sheets slightly overlapping one another and using a rolling pin, roll them to make a 1 large pastry dough to fit the tart form. Lay the pastry in the tart form. Prick the bottom of the pastry dough with a fork in many random areas. Pour the poaching syrup into the bottom of the pastry. Place the poached quince pieces in the form and place in the oven to bake for 18 minutes or until the crust is lightly golden brown. When the tart is done, remove from the oven and allow to cool for about 20 minutes in order to set the liquid. This tastes lovely with a cup of good coffee. 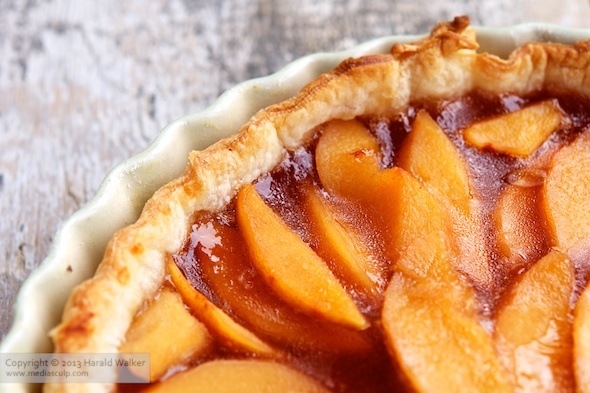 Posted by Chris Walker on December 1, 2011 in Desserts and Sweets, Puff Pastry, Quince.